We know that Andhra Pradesh Public Service Commission will conduct the Department tests every year with objective type and few tests are written exams as per its own schedule from time to time. APPSC Departmental Tests May /November 2018 session i.e Notification no. 04/2018, which was issued in October for the AP state employees and candidates. The APPSC department officials invited the online applications from the eligible candidates as per its schedule. The candidates who were applied for this stream, they were attended the departmental tests May /November 2018 session which were held as per its exam schedule as per notification time table in 6 days in the 13 districts Head Quarters of state of Andhra Pradesh including Hyderabad and the appeared candidates can check their results. Help Desk:In case of any doubt/ clarification or difficulty in downloading the Hall Tickets, the candidates may contact the officials at the telephone numbers given below against each. 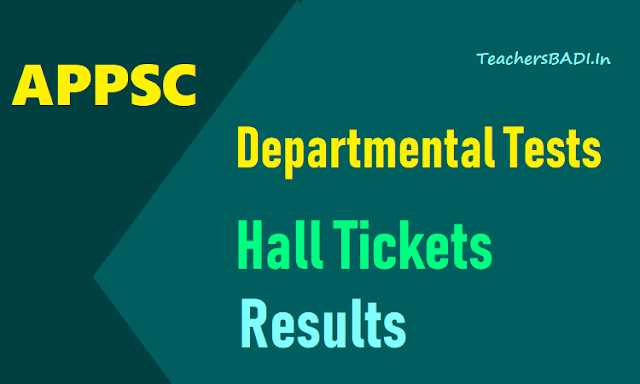 Note:The Hall Tickets for Departmental Tests are available. HallTickets for Departmental Tests November /May Sessions are available for download at its official website. 1. Please type the Reference ID or Name or Date Of Birth to check your results. 2. Please use the PRINT button provided on Results to get all the pages printed without distortion. A. How to know Hall tickets details?.. Step 6: and Result PDF file would be opened. In this file search your hall ticket with use of Control + F buttons of your key board. Step 8: Enter your results in your Service Register with the pages. I am working for APPSC education department and recently passed the GO test.From where can I get certificate for the departmental test I passed? Applicants, who selected for APPSC Group 2 Mains Examination are inform that the Mains exam will going to held on 20th May 2017. Candidates can modify their Preferences like Zonal/Posts/District etc. till 15.05.2017. Group 2 Call letter will issued 07 days before examination. You can check more information about Correction/ Modification & APPSC group 2 Hall ticket from official website.